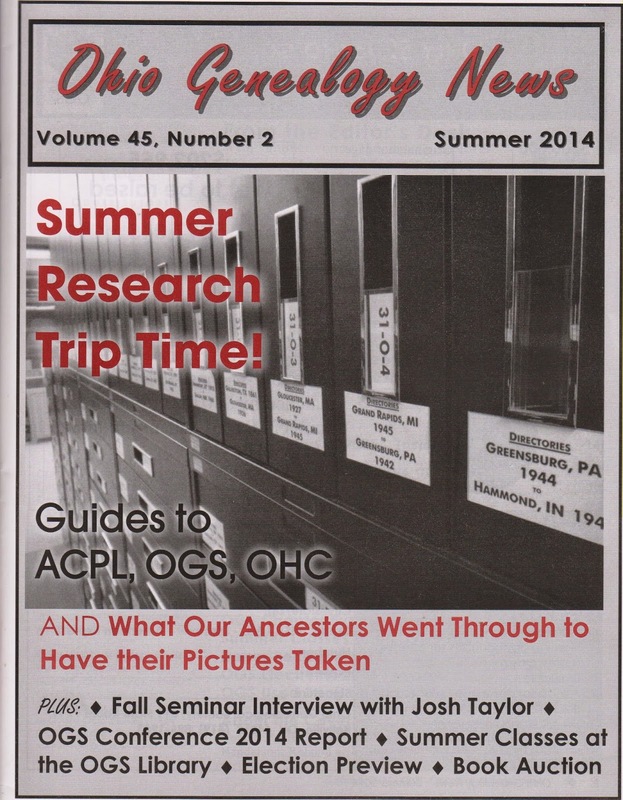 The peppy Ohio Genealogy News has information that many researchers will want: detailed information about the Ohio History Connection (formerly Ohio Historical Society) by Shelley Bishop, the Ohio Genealogical Society Library by Tom Neel (in an interview), and the Allen County Public Library Genealogy Center in Fort Wayne, Indiana by me. Those who frequent the center will recognize the cover photo: a sidelong view of its banks of microfilmed city directories from all over. OGN also has a way of including material of interest well northwest of Toledo and southeast of Marietta -- in this issue, Diane Van Skiver Gagel describes the tortures our 19th-century ancestors went through to be photographed. Even those few with no Ohio relatives will find useful material here. Join OGS to get in on the action and read OGN on line. Harold Henderson, "Allen County Genealogy Center: Midwestern Mega-Library," Ohio Genealogy News 45 (Summer 2014): 14-17.